Upcoming International Space Station Payloads Design and Operations Safety Training Course » A-P-T Research, Inc. 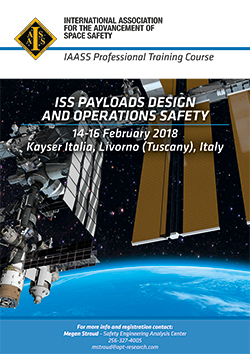 The Challenge: The course is designed to provide the participant with an understanding of safety requirements, procedures and processes that are used for design and operations of payloads for the International Space Station. Scope of the course: This course is designed as a guide to the ISS payload/cargo safety review process. The student will gain an understanding of the applicable safety documents and key safety technical requirements, of payload/cargo safety as it relates to the overall development and integration process, how the payload/cargo safety review process works, and the roles and responsibilities of the various players. In addition, the student will be instructed in the hands-on fundamentals of hazard analysis, hazard documentation, and presentation to the Payload Safety Review Panel. Other technical discipline personnel who contribute to the design and operations of ISS payload/cargo and need to understand the process by which hazards are identified and controlled. The course e-binder including presentation and selected set of reference documents.